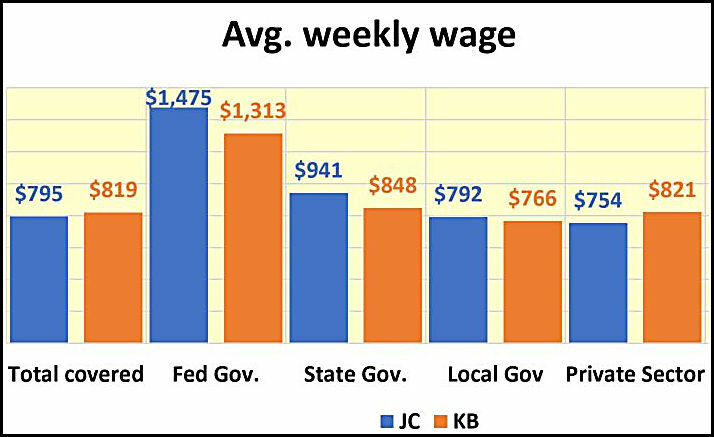 Tri-Cities federal workers have the highest average weekly wage for major labor market subgroups. Those Bureau of Labor Statistics Quarterly Census of Employees and Wages subgroups include total workers covered, the private sector, federal, state and local government sectors. 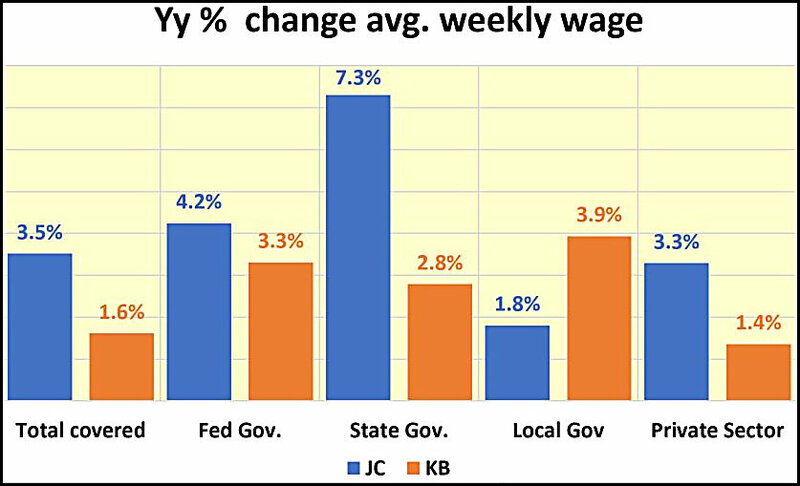 The next best-paid group is state workers, and those in that group in the Johnson City Metropolitan Statistical Area (MSA) have seen the biggest year-over-year pay increase so far this year. Wages for local government employees are closer to what private sector workers get. The wage groups drill down illustrates why the region’s average private sector wage – typically the lowest in Tennessee – is not reflective of median household incomes. It’s also instructive of the composition of the local labor market. October’s BLS preliminary, not seasonally adjusted count of nonfarm jobs showed a seven-county Tri-Cities total of almost 205,000. The private sector portion accounts for a little over 171,000 jobs. There are almost 20,000 government workers. The reason the private sector and government job totals don’t add up to the nonfarm total is non-profits and not-for-profits are not counted. Here’s how the jobs breakdown for the three-county Johnson City MSA and four-county Kingsport-Bristol MSA looked in October. The government jobs are totals at the end of Q2 this year. Clicking on image renders a larger file. The year-over-year wage gains for each of the groups also differ. Johnson City groups – with the exception of local government workers – had the largest increases in the region. Job creations during the year pushed October’s nonfarm and private sector totals higher than last year’s annual totals for both metro areas. The same holds for the Q2 totals for all three government worker groups in both Tri-Cities metro areas.